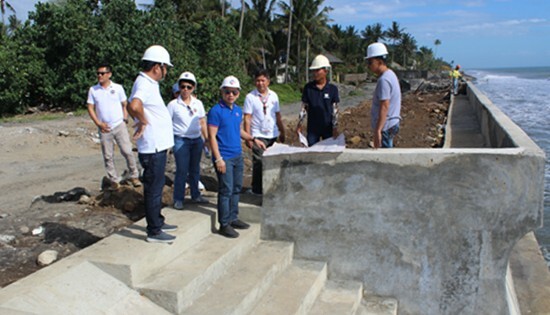 DULAG, Leyte – A total of P48.5 million has been poured out by the Department of Public Works and Highways (DPWH) Leyte Second District Engineering Office for the construction of seawall along coastal villages in Dulag, Leyte. The project will protect and reduce coastal hazards to the residents of Brgy. San Jose and Brgy. San Rafael critical to storm surge. District Engineer Gerald Pacanan said that the embankment project involves stone masonry with a total length of 482.5 meters and height of 2.5 meters. The seawall will serve as protection from storm surge during occurrence of typhoon and alleviate the problems of erosion along these coastlines. For 2018, the district has carried out a total of eight flood mitigation projects amounting to P271.68 million, of which four are completed and the rest are still ongoing.